Guided and independent walking holidays - Our walking holidays in France take place in a range of different locations from the vine covered hills of the Burgundy to the high mountains in the Alps. We have holidays for all levels and interests and for different times of the year. France has a wide range of stunning natural landscapes, as well as regions which retain their local identity, with distinctive cuisine, local culture and a strong historical heritage. Independent walking holidays - Our walking holidays in southern England explore the beautiful coutryside and settlements of Dorset and Wiltshire and rugged north Cornwall and Dorset's Jurassic coastal paths. Further destinations will be introduced soon. The holidays take in some quiet, unspoilt regions as well as visiting some of the most spectacular sites in the UK such as Stonehenge and Lulworth Cove. Independent walking holidays - Our unique walking holidays in Scotland are a great mix of multi day walking and centre based exploration, to allow everyone to get the most out of their walking holiday. Our holidays explore the Trossachs National Park, the best sections of the West Highland Way, the rugged west coast, as well as some beautiful islands such as Skye and Mull. Independent & Tailor-made guided walking holidays only for private groups - Spain has some of Europe’s wildest mountain and coastal areas. We have an independent walking holiday on the Pyrenees - Mediterranean coastal trail. Tailor-made guided walking holidays are also possible in the Picos de Europa in the north, a green and rugged chain of mountains, and the Jalon Valley, the craggy limestone hills and mountains on the east coast. 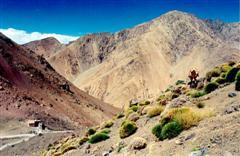 We have a selection of Tailor-made Guided trekking holidays for private groups in Morocco in North Africa.